Years ago the rule was that you should change your oil every 3,000 miles. However, Consumer Reports released a study that illuminated little difference between 3,000 miles and 7,500 miles. The Quick Lane Tire and Auto Center references your specific vehicle’s manufacturer recommendations. Many newer vehicles can go 5,000 to 10,000 miles without an oil change. Much depends on your specific vehicle. For instance, many hybrid vehicles don’t need auto service as often as traditionally fueled cars and trucks. That being said severe conditions require more frequent oil changes. Speak with your Service Advisor for a more information. 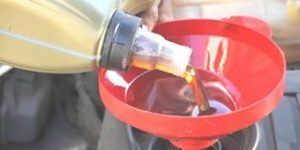 Keeping your car in optimal running condition is easier when oil changes and necessary maintenance items are completed. The Gresham Quick Lane Tire and Auto Center is ready to serve and you never need an appointment. Quick Lane Service Advisors want to earn your business. 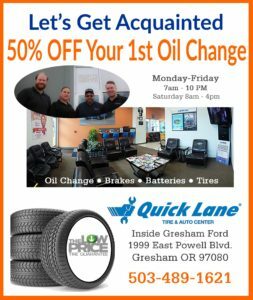 Visit the Gresham Quick Lane and get Half Off your first oil change. The Gresham Quick Lane is located on Powell Blvd in Gresham. Conveniently located near highway 212, highway 26 and just a short ride from I-84. Remember that the Quick Lane stays OPEN until 10pm weekdays for your convenience as well.